With new features and a sleeker, more athletic design, the Edge is moving upscale. COLOGNE, Germany -- Ford Motor believes it can win premium brand customers in Europe with the Edge large SUV, which will go on sale in the region late next year. The Edge will be aimed at "affluent" customers considering medium-sized SUVs such as the Audi Q5 and Volvo XC60, but looking for more space, Ford of Europe's head of sales and marketing, Roelant de Waard, said at the SUV's European press launch here on Tuesday. The Edge is important to Ford's plan to return to profit in Europe by next year, Ford of Europe CEO Stephen Odell said. The company is "very much on track" to achieve that, Odell said at the Cologne event. The Edge will be Ford's first large SUV in Europe since the automaker phased out the Explorer in 2001. Jim Farley, head of Ford's global sales and marketing, said that in Europe the Edge will be aimed at market-leading SUV/crossovers from Audi, BMW and Mercedes-Benz. The Q7 starts at 53,500 euros in Germany. Palmer declined to comment on its pricing compared to the Audi Q5, which starts at 35,900 euros. Ford aims to triple its European SUV sales by 2018 from 90,000 last year with the Edge and its other SUV offerings, the medium-sized Kuga and subcompact EcoSport. De Waard said Ford expects annual European sales of 20,000 for the Edge. Sales of the Kuga in Europe increased by 38 percent to 39,700 in the first five months, Ford said. The Indian-built EcoSport has just gone on sale in the region. Ford said it has 16,000 orders from European customers for the EcoSport. Ford said the SUV segment percentage of the total European passenger car market more than doubled to 21 percent in 2013 from 10 percent in 2008. De Waard said the Edge would offer technology to rival premium SUVs. Equipment available will include adaptive steering that alters the ratio depending on speed to make it easier to maneuver in urban situations, the first Ford to offer this technology. The Edge will also become the first European Ford to be offered with noise canceling technology that detects unwanted noise via cabin microphones and generates ‘opposing’ noise to block it out. Other technology includes Ford’s Sync 2 connectivity system that links a smart phone to an eight-inch screen on the dashboard. In Europe, the Edge will be sold with two versions of Ford’s 2.0-liter diesel engine, one with 180hp and CO2 emissions of 149 grams per km and the other with 210hp and emissions of 159g/km. All versions offer four-wheel drive. The Edge was introduced in 2006 primarily as North American vehicle. 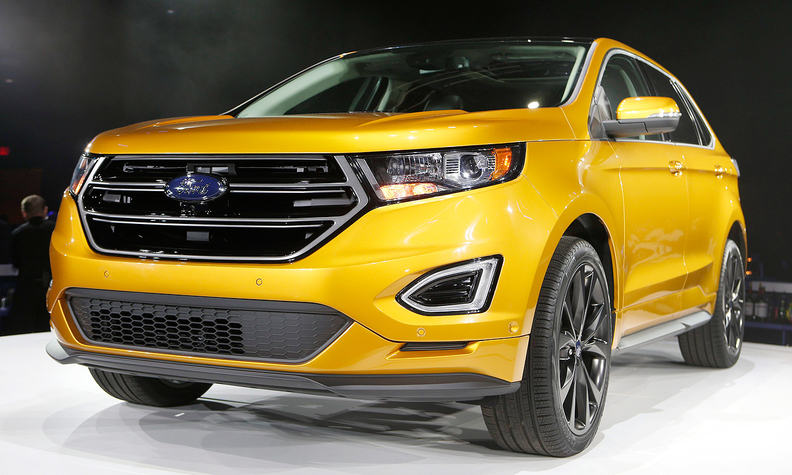 Ford said on Wednesday that the Edge will be sold in more than 100 markets. As part of the global rollout, the Edge will be made for the first time in right-hand drive versions. The SUV is built in Ford’s Oakville plant in Ontaria, Canada. The Edge is based on Ford’s new C/D platform shared the forthcoming Mondeo and its U.S. sibling, the Fusion, and also the forthcoming S-Max and Galaxy minivans. Ford has redesigned the Edge with a body that is 26 percent stiffer when reacting to bending forces and 16 percent stiffer in reaction to twisting forces. The suspension retains MacPherson struts in front and has a new integral-link independent rear suspension with coil springs. Ford engineers say the new Edge has to perform on Europe’s often-narrow, twisty roads. It will also have to hold its own on the German autobahn for the first time. In the United States, Edge sales have remained consistently above 100,000 units since 2007, the first full year it was on sale. IHS Automotive forecasts that Edge sales in Europe will reach 8,000 units in 2016 and that the SUV's second-largest market will continue to be China at about 30,000 units in 2016.